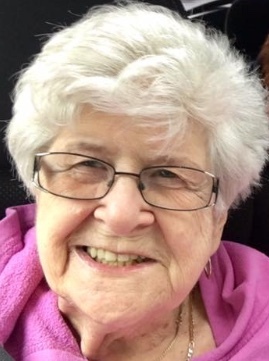 Barbara Christine Ainslie, 86 of Salem, NH., passed away under hospice care at Salemhaven Nursing Home on Thursday, April 11, 2019 surrounded by her family. Barbara was born on June 24, 1932 in Melrose, Massachusetts. Daughter of John and Virginia d'Entremont. She grew up in Somerville, Massachusetts and she worked in a factory as a seamstress at Star Sportswear in Lynn. Barbara was a very hard worker. Barbara raised her family in Peabody, Massachusetts with her former husband Paul Ainslie. After she retired she resided in Salem, NH. with her daughter Sharon Mathieu and daughter in law Melissa Mathieu. She was a spunky woman who loved spending time with her family and friends. She was very active in her local senior center for many years. Teaching exercise classes, playing cards, and participating in any dances would be where you would find her as she loved to dance. She also enjoyed the crazy hat days that they would hold at the senior center. Barbara always was dressed beautifully with her jewelry and make up on a daily basis. She took such pride in her appearance. On her down time she would love to watch TV especially General Hospital and The Bachelorette. Barbara will be remembered for her kindness towards all no matter who they were. She was considered one of the favorite aunties in her family. Barbara is survived by her daughter Lois and James Downey, son Dennis and Nancy Ainslie, daughter Sharon and Melissa Mathieu. Grandchildren; Lee Mooers, Ryan Marino, Justin Downey and his spouse Krystal Downey, Dallas Alicea, Cassie Downey, Brady Alicea Patrick Glennon, and Sean Glennon. Great Grandchildren; Kevin Marino, Lucas Downey, Jake Downey and Tanner Downey. Beloved sister Phyllis Handy along with numerous nieces and nephews. She is predeceased by her father and mother John and Virginia d'Entremont and a sister Lorraine d"Entremont. Family and friends may call on Saturday, April 20, 2019, for 9 to 12 noon at the Goundrey & Dewhirst Funeral Home, 42 Main St., Salem, NH. Funeral services will begin at 12 noon. In lieu of flowers, donations may be sent to Amedisys Home Health Hospice, 18 Orchard View Dr., Unit 4, Londonderry, NH., 03053. There's still time to send flowers to the Visitation at the Goundrey & Dewhirst Funeral Home from 9:00 AM to 12:00 PM on April 20, 2019.